Some very strong headline figures on Irish growth in 1Q 2015 are out today from the CSO so I will be blogging on these in a number of posts today. To start with, let's take a look at data on GDP composition at Factor Cost - in other words, contributions of various economic sectors to GDP on output side of the National Accounts. 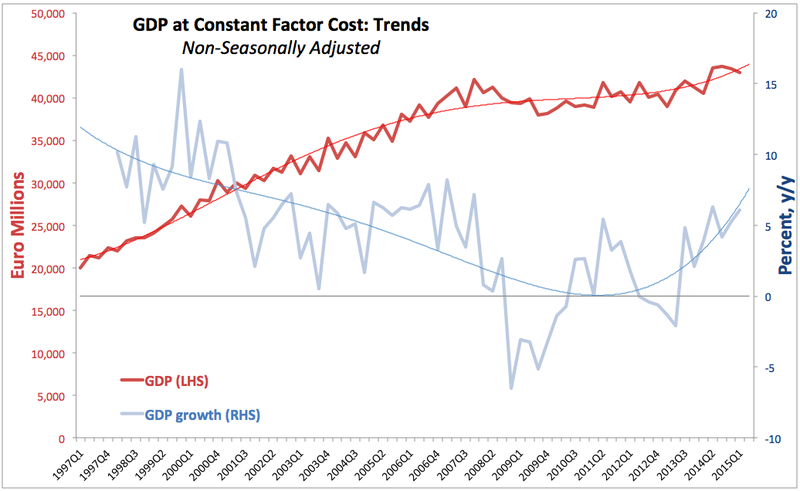 The analysis below references real GDP (adjusted for prices changes). Agriculture, Forestry & Fishing sector posted growth in output of 5.8% y/y. This contrasts with growth of 21.0% recorded y/y in 4Q 2014 and with 16.5% expansion y/y in 1Q 2014. This is the slowest growth in the sector since Q3 2013. Overall, in annual terms, the sector accounted for 2.02% contribution to the overall GDP growth (Factor Cost GDP) or EUR50 million y/y (compared to EUR194 million added by the sector in 4Q 2014). The sector was the second smallest contributor to growth in GDP (at Factor Cost) in 1Q 2015 after Building & Construction. Quarterly growth in the sector was negative: in 1Q 2015 Agriculture et al sector shrunk (on seasonally-adjusted basis) by 30% compared to 4Q 2014 and this contrasts with 25.4% growth q/q recorded in the sector in 4Q 2014. Industry (ex-Building & Construction) grew strongly in 1Q 2015, posting y/y expansion of 9.63% compared to 8.71% expansion in 4Q 2014 and 0.56% growth in 1Q 2014. This marks 1Q 2015 as the fastest growth quarter (y/y terms) since Q3 2014 and the second fastest growth quarter (y/y) since Q4 2010. As the result, the sector accounted for 39.1% of all growth recorded in GDP (at Factor Cost) in 1Q 2015. The sector was the single largest contributor to GDP (at Factor Cost) growth in 1Q 2015. A caveat here is that this sector growth is strongly influenced by the MNCs, especially Pharma, Bio and Medical Devices sectors, but more on this when I am covering external sectors performance in subsequent posts. Quarter on quarter growth in Industry (ex-Building & Construction) was much less impressive than annual growth rates. In 1Q 2015, Industry contribution to GDP actually was negative on q/q basis at -0.31% compared to 5.16% growth recorded q/q in 4Q 2014 and 3.35% growth recorded q/q in 1Q 2014. Building and Construction sector posted positive y/y growth of 3.26% in 1Q 2015, which contrasts positively with a -0.16% contraction y/y posted in 4Q 2015. However, 1Q 2015 y/y growth was much weaker than 9.66% growth recorded in the sector in 1Q 2014. Overall, Building & Construction sector contribution to growth in GDP (at Factor Cost) stood at 1.38% in 1Q 2015 - the smallest positive contributor to growth in 1Q. Distribution, Transport, Software & Communication (DTSC) sector made a strong contribution to growth in 1Q 2015, with activity up 6.5% y/y. The rate of annual growth is relatively steady in the sector, having posted growth of 5.4% in 4Q 2014 and 5.93% growth in 1Q 2014. 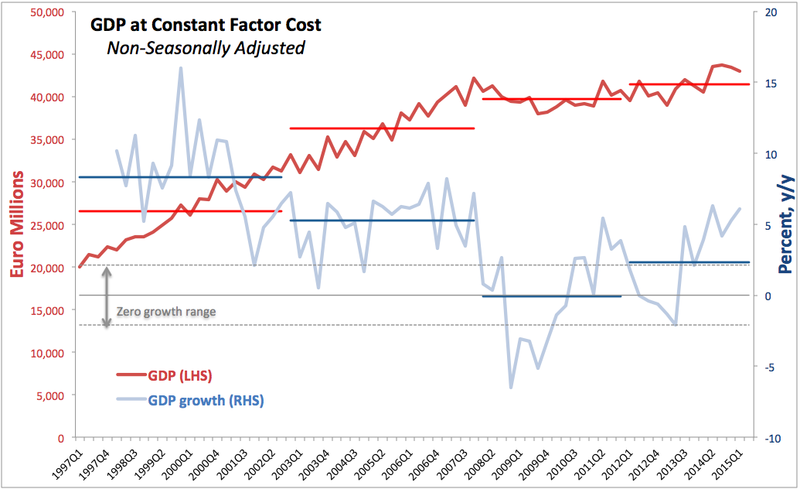 The sector accounted for 29.1% of total growth in GDP (at Factor Cost) in y/y terms. The caveat applying to these figures is that the sector includes many ICT-related MNCs which have been recently posting growth in tax optimisation-linked activities. Quarterly growth in the sector was also positive, with 1Q 2015 activity up 2.11% on 4Q 2014, after posting growth of 1.05% q/q in 1Q 2014. Public Administration & Defence (PAD) sector posted another quarter of annual contraction in activity, shrinking -5.52% y/y in 1Q 2015 after posting -3.09% decline in 4Q 2014. In contrast, the sector expanded by 2.21% in 1Q 2014. Overall, sector made negative contribution of -3.4% to annual GDP (at Factor Cost) growth in 1Q 2015. This marks the largest contraction in annual growth rates in the sector since 2Q 2012. Other Services (including rents) sector posted another quarter of steady growth, rising 4.42% y/y in 1Q 2015, having previously posted growth of 4.40% in 4Q 2014 and 4.12% in 1Q 2014. 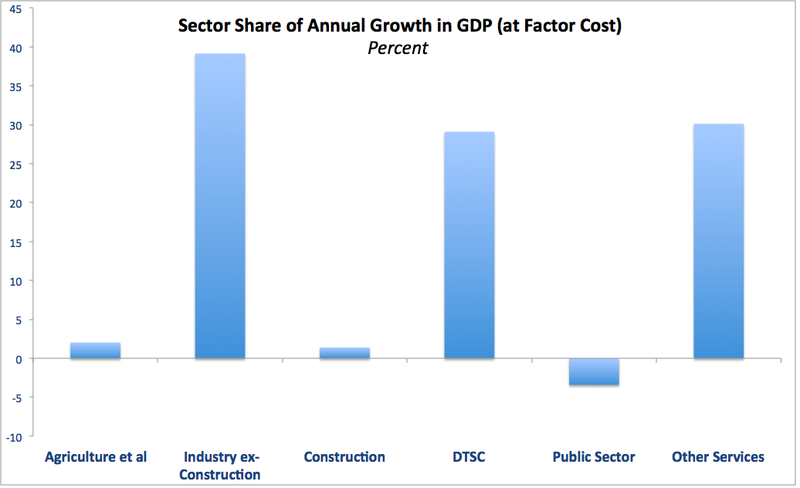 Sector contribution to overall growth in GDP (at Factor Cost) was 30.1% - second largest after Industry ex-Construction. The above clearly shows that the bulk of growth in 1Q 2015 by sector must be compared against growth in exports to attempt to control for MNCs activities before drawing any conclusions about headline growth figures anchoring to the real economy. I will do this in subsequent posts, so stay tuned. 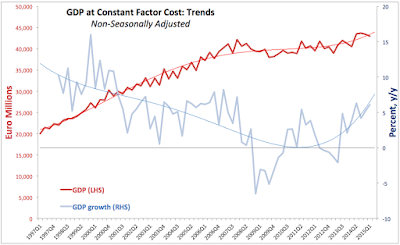 Overall, real GDP at Factor Cost posted growth of 6.1% y/y in 1Q 2015 - a healthy figure compared to 5.28% growth recorded in 4Q 2014 and to 3.87% y/y expansion in 1Q 2014. Thus annual rate of growth accelerated in 1Q 2015 compared to 4Q 2014 and to growth a year ago. Overall, sectoral activity expanded GDP by EUR2.47 billion in 1Q 2015 compared to growth of EUR2.176 billion in 4Q 2014. As chart above shows, annual growth rate is currently running above the period average (2012-present) and marks statistically significant rate of annual growth. Which is very good news. On a quarterly basis, GDP (at Factor Cost) grew by a more modest 0.74% quarterly rate in 1Q 2015, slightly slower than in 4Q 2014 when it expanded 0.79% q/q and much slower than in 1Q 2014 when it grew at 1.57% q/q. This marks 1Q 2015 as the slowest quarter over the 5 consecutive quarters and the second slowest in 8 consecutive quarters. 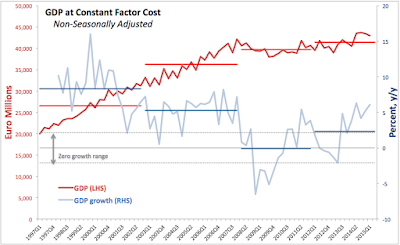 Based on annual rates of growth and levels performance, Irish real GDP (at Factor Cost) is on a renewed positive trend. Once again - good news. Stay tuned for more analysis of the National Accounts figures in subsequent posts.